This is one of the Birthday presents bought for me by my wife and daughter for reaching the grand old age of 38. Since Tamiya released this little kit I have to admit that I really wanted to build it. The Simca is a really small kit and placed in a larger diorama setting, I think it would be lost quite easily. So the plan at this moment in time is to display the vehicle on a small base with some additional figures to add context to the piece or in other words "less is more"
The only problems that I can foresee with this kit at the moment is the internal wheel well that Tamiya provide (see Photos below). Once the kit is assembled, if you looked through the windows of the vehicle and into the rear, you will be able to see the half wheel section that tamiya provide with the kit. 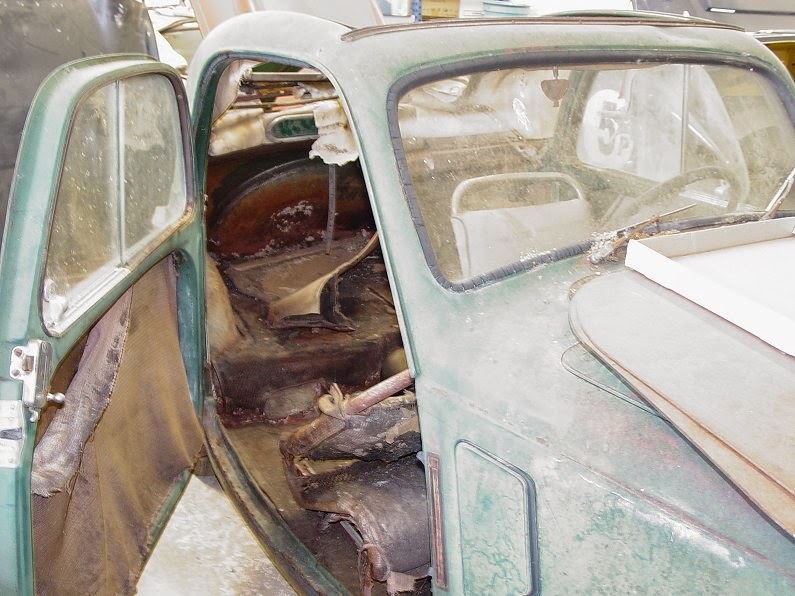 I will have a look around on the internet to see if I can get any reliable interior shots of the Simca to evaluate whether a scratch building session might alter the appearance. Failing this I will probably add a lot of German kit, etc in the rear of the vehicle to disguise this flaw in the kits design. After a little research on the internet I came across a web page that shows a 1947 Simca that has been rescued from a scrap yard. fortunately there a two particular photos that clearly show what the spare wheel well should look like. (these are below). To remedy the interior of the model I will cut a small disc of plastic card and glue this onto the wheel in the interior and possibly add some Squadron putty to the edges to provide a more rounded finish as seen in the real vehicle. The other additions I intend to make to the Simca are the door bins and handles to the interior section of the door and the running boards along side the vehicle which are not present on the Tamiya kit but are present on every photograph of the real vehicle that I have seen on the internet with the extended rear arches as depicted on the Tamiya kit. I could theoretically reduce the size of the kits rear arches but I have opted to take the easier path of adding running boards. 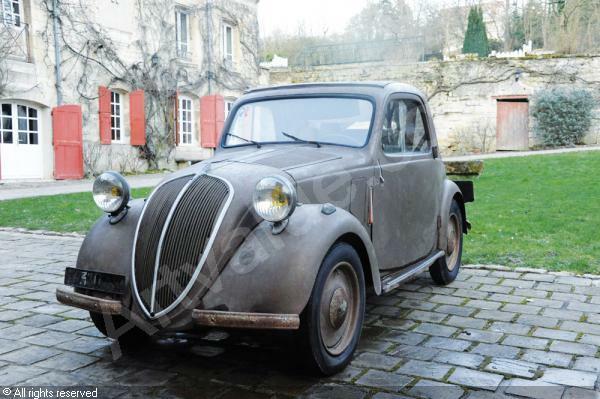 The photos below show the two different models of the Simca. 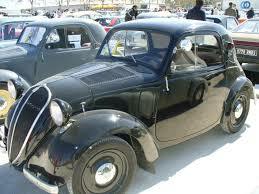 The black vehicle does not have the boards but has wasted arches on the rear. The grey Simca has the same arches as the Tamiya kit but also has the running boards that I will be adding. Its only a small difference and if I had not been snooping around the internet looking for interior photos I would not have noticed the subtle differences. I would also add that I may be completely wrong in my assumption of the running boards, but at the very least it will make my Simca a little different from the others! I will probably replace the rather thick open roof canvas part that's provided with a lead foil version that should look a little better. I've also decided to use two figures from another build that I have on hold for the driver and passenger of the Simca as I had previously modified the figure that Tamiya provide with the kit. I also found an old Tamiya road police figure and road sign from one of my very early models that was scrapped. I am not actually sure what kit this is so I can't me more specific unfortunately. The base for this vehicle is going to be small and simplistic. The frame is actually a section of a larger picture frame purchased from Ikea for my Egg Plane dio. The base or insert of the frame is some foam board that's been cut and glued in place. The plan is to depict a crossroads in the Normandy region with the Simca being told to stop to allow a small unit of men to walk by; as I previously stated:- Less is more!